The latest figures show that global divorce rates continue to be on the rise. Across Europe and the United States, average divorce rates range between 42%-65%. 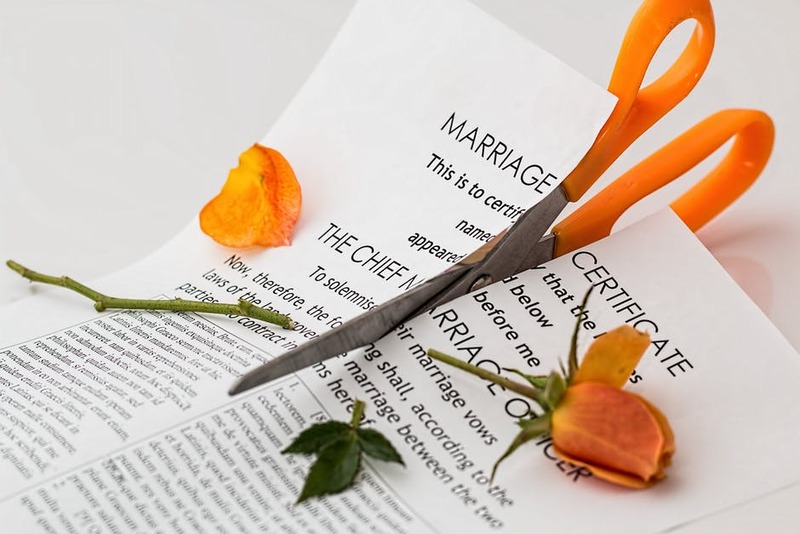 No matter how amicable the split may be, there are many stressful steps to a divorce. It is not uncommon for the process to cause feelings of anxiety and depression. This is especially true if an individual is not looking out for his or her wellbeing in the steps leading up to the divorce being granted. If you are going through or will be going through a divorce, self-care is of top-importance. While some may consider the term “self-care” to refer to luxury and pampering, it simply refers to the practice of taking care of one’s self. Explore three must-do self-care strategies for individuals who are going through a divorce. Never underestimate the power of a good night’s rest, especially during stressful times. In addition to feeling drowsy and tired throughout your day, a lack of sleep can have many other consequences. Over the long-term, it can put you at risk for “high blood pressure, heart disease, obesity, and diabetes.” In addition to these serious risks, sleep deprivation can impair your ability to think clearly, dulls the skin, causes mood swings, and can cause you to gain weight. To avoid these health challenges, experts recommend that you get between 7 to 9 hours of sleep each night. If you are not able to realistically achieve this, work toward getting proper rest on as many nights as you can, especially during the most stressful parts of the divorce. Since many of your days can be focused on signing papers, court hearings, and various disputes, it is crucial to have a healthy hobby to take your mind off of things. Whether you enjoy reading, crafts, baking, drawing, or journaling, choose one or more hobbies in which you can distract yourself from time to time. Hobbies have been shown to help individuals relieve stress, increase mindfulness, promote overall physical health, deliver new and fun experiences, and boost self-confidence. To ensure that you are taking advantage of these benefits, schedule at least a few hours in each week to practice your favorite hobby/hobbies. Even when an individual isn’t going through stressful times, exercise is a key component of one’s health. Physical activity of all kinds offers loads of benefits, including a boost to your mood, maintenance of a healthy weight, enhanced energy levels, improved cognitive function, lowered risk of chronic illness, and improved sleep quality. As you can imagine, these benefits are even more valuable while going through the stress of a divorce. At minimum, plan to practice your favorite form of exercise for 30 minutes a day, 5 days a week. Both low-impact activities (e.g. walking, yoga) and high-intensity workouts will deliver much of the same benefits. For nearly every person who goes through the process, divorce marks a stressful time in one’s life. To reduce the impact of the associated stressors, practicing self-care is an absolute must. By ensuring that you are getting proper sleep, choosing to regularly engage in a favorite hobby, and getting routine exercise, you can fight off the negative effects of any stress you experience. 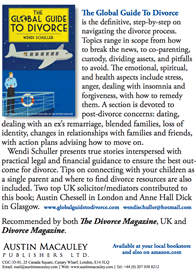 Author of this article, Lucy Davis, runs The Divorce Club www.divorceclub.com an online support network for people going through divorce and separation. There are fun events scheduled (check their web site). Wendi’s Note: The Divorce Club in London is a great way to meet others who are going through similar experiences. Wisdom and laughter are shared at Lucy’s get-togethers through this MeetUp.com group. Divorce is among one of the most stressful events that we can go through in our lives. It’s second only to the death of a loved one. However, if you ask around, you might hear that even death might be easier to deal with than a family that is torn apart over abuse or betrayal. Besides divorce, we face stressful life situations day in and day out: maintaining hectic schedules, demands of work and family, the emotional needs of important people in our lives, financial stress, and self image are a few things that quickly come to mind. One proven way to reduce the physical and emotional stress of a divorce is through regular physical activity. Pair this approach with talk therapy, self-improvement, and medication when appropriate and you have all the tools you need to heal and happily move on with your life. Scientists have long since seen that having too little exercise can have a major negative impact on mood and mental health. One of the most common pieces of advice from any medical professional is to make sure you are getting some physical activity in everyday, whatever that activity might be. As you move through the difficult stages of divorce, from the first filing to navigating a new world of dating and single parent life, keeping physically active is a natural way to help lower the stress levels that are impacting your body. If you are finding yourself slipping into depression or being overwhelmed with stress, a simple and affordable solution to this problem is to make fitness unavoidably accessible. If the gym is a good social setting for you, grab a membership and get to work. If exercising at home suits you better, home gym equipment is an affordable way to stay on top of a fitness routine. Being realistic with your current state, your time restrictions, and other life factors, decide the best route for your physical activity and get on it! How Exactly Does Physical Activity Alleviate Stress? Physical activity produces more endorphins. Endorphins are the feel good chemicals of your brain that naturally elevate your mood. They make you happier, more cheerful and help to replace pain, both physical and emotional. Physical activity takes your mind to a healthy place. Nothing is worse for stress than sitting and dwelling on a problem, replaying past scenarios or recent arguments, worrying about things out of your control, or whatever it might be. While feelings can’t be ignored, they should definitely take a back seat on a regular basis to make room for positive thoughts and growth. Exercise encourages focused thought and can even act as a form of meditation, removing the stressful thinking from the brain and helping you think about other things. Physical activity increases self esteem. Stress plays a major part in the way we view ourselves. A “can’t-do” attitude is prevalent as we worry or doubt ourselves. 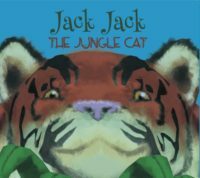 This slippery slope is quick to move past the current issues at hand and bring to light other worries and doubts we’ve had about ourselves whether it be our appearance, our work ethic, our parenting, and more. As you increase your physical activity, you reach goals (confidence boost #1), increase physical and mental strength (confidence boost #2), and enhance your physical appearance (confidence boost #3). With these three motives for self-growth, self-esteem is bound to grow as well. In the end, exercise is one of the best things for us. Especially when we are being bombarded with stress. Implement a regular schedule of “you” time to get your body moving, your endorphins flowing, your mind lightened, and you’ll work through those stressful issues at hand. Every woman knows the feeling: After countless days of work, eat, sleep, and little else, energy drops to an all-time low and sanity starts to waver. You question why you’re working so hard at all, and if any of it even matters. It’s all too easy to let the stresses of daily life get you down, but giving up isn’t the answer. What you need is to regain balance in your life so you can bring your best to each and every day. Here’s how. Even if you love your job, spending 40-plus hours a week at work can wear on you. Whether it’s an overly-demanding boss, inefficient coworkers, or just the mundanity of the same thing day in and day out, a full-time job is bound to get to you. When it does, you’ll need strategies to cope. When it comes to stress management, the best offense is a good defense, so make sure you’re practicing good sleep and diet habits and working exercise into your schedule. A healthy lifestyle is one of the best defenses against stress and its cousins, depression and anxiety. To ensure enough time to take care of your personal needs, set professional boundaries with an eye on work-life balance. Don’t make a habit of working overtime. If your boss gives you a project with an unrealistic deadline, negotiate the timeline rather than scrambling to get it done. Colleagues constantly interrupting your lunch break with work requests? Start leaving the building during lunch so you can use that hour to relax. When you walk out of the office at the end of the day, turn work off. No matter how strong the temptation, don’t check your email or squeeze in “just one more hour” of work. Avoid venting about work as much as possible, and when you just have to, stick to a hard limit of 20 minutes. The last thing you want is for your workplace stresses to seep into your home life. Women today are expected to do it all — have a successful career, a loving relationship, happy children, and a Pinterest-worthy home — but living up to those unrealistic standards can leave little time for actually being happy. Try to focus less on outward appearances and more on taking care of your own needs. What does that look like? For starters, make sure you’re getting plenty of sleep each night and eating healthy meals. Eating well both preserves your health long-term and keeps you happier and more energetic now. In fact, good nutrition has been linked to better health outcomes in everything from cardiovascular health to mental health. But self-care is about more than meeting your basic needs. It’s about building a rich personal life that brings you joy and fulfillment. That means making time for hobbies, cultivating new interests, spending time with the people you care about, and practicing gratitude every day. Pets take care of us in more ways than we give them credit for. In fact, the simple act of being in the presence of a furry friend has emotional benefits. Spending quality time with your pet can be an instant mood-booster and can help stabilize your stress over the long-term. If you don’t currently share your home with a critter, consider adopting one from your local shelter. Saving the life of an animal in need will instantly lift your spirits every time you see your new family member. If adopting isn’t an option, you can enjoy the emotional perks of spending time with animals by offering to help with friends’ pets, such as by dog boarding in your home or even dog walking. When everything is going wrong at work and life is a mess, it’s friends and loved ones that can lift you up and get you back on your feet. That’s why no matter how busy life gets, it’s critical to always nurture your personal relationships. Social relationships are so important that they actually help us stay happier and live longer. To make sure you sustain this pillar of wellness, carve out time every week to connect with your friends, family, and romantic partners. Whether it’s a Saturday barbecue or a quick phone call, making time for relationships helps them grow stronger. Of course, personal relationships aren’t without their own stresses. Whether it’s a boyfriend or a best friend, work through your relationship issues respectfully and lovingly. Arguments come and go, but when you treat them right, good people stay by your side for a lifetime. Life can be overwhelming at times, but when you take care of yourself and prioritize your needs, you can get through whatever the day throws at you. Try implementing these tips in your daily life as part of your journey to a less stressful, more centered life. Weathering the holidays after a divorce can be difficult for a newly-single parent. You’re trying to make sure the season is a fun, festive time for kids whose family photos will likely look a lot different this year than last, while possibly balancing the wants and needs of the other parent. But, even with all of those demands, it’s critical to take care of your own physical and mental health, particularly if the despair of divorce left you depressed. Here are some suggestions that could help you and your loved ones have a happier holiday season. Under most circumstances, both divorced parents should share the joys of the season with their children. To make that as painless as possible for everyone involved, it’s important to set a schedule you can agree on and communicate clearly. Rather than visiting one another’s new homes — which may well be decked with holiday decorations you once shared, or sadly under-adorned — consider dropping off and picking up the kids on some neutral ground that’s festively festooned for the season. If the kids are staying with your ex for a while, make plans to spend time with others rather than going it alone. You may also consider joining a support group or signing up for volunteer opportunities. Doing for others will help keep you from dwelling on your divorce, according to Divorce Magazine. Studies have also shown that volunteering can lower depression, increase people’s sense of well being, and even lead to a longer life span. Experts say the positive effects could come from the good feelings volunteering creates, the increased social connections, or the simple act of getting off the couch. In addition to making time for others, you should devote some days to self-care. Make sure you’re getting enough rest, eating right, and exercising. Burning off some calories justifies some guilt-free holiday indulgences. Finding time during the hectic holiday season to work up a sweat and balancing good nutrition with an occasional slice of pie will also help boost your spirits without having the same effect on your weight. If your mood declines with the temperature, don’t discount depression as a run-of-the-mill bout with the winter blues. It might be a case of seasonal affective disorder (SAD). For most, symptoms start in the fall, stretch into the winter months, and become more pronounced as the season continues, according to the Mayo Clinic. Although it’s less common, spring and summer bring on seasonal affective disorder for some. In either case, symptoms could include changes in appetite or weight, sleep problems, and difficulty concentrating. It’s normal to have some down days, especially after a life-changing event like divorce. But if you feel depressed for extended stretches and can’t get excited and motivated to participate in activities you typically enjoy, it might be time to seek help. This is especially true if your appetite and sleep habits have changed or if you indulge in alcohol to feel comfortable or relaxed. If you have persistent thoughts of death or suicide, it’s critical to call your doctor even if you haven’t experienced other signs of depression. After a divorce, you may feel as though you’re doing double duty as a parent during the holidays. But taking care of your own physical and mental well-being when you have so much to do for friends and family isn’t seasonal selfishness. Rather, it’s essential to helping everyone have a happier, healthier holiday season that will bring up warm memories for years to come. Engaging in regular exercise is one of the smartest investments anyone can make, especially if you’re a single parent who needs the energy to keep up with her kids. And when we say “investment” we’re talking about time and effort, not money. To show you what we mean, here are several free (or almost free) ways to get in shape. Use these tips to give you the guidance and motivation you need to achieve your fitness goals. Pushups. This one exercise can do you more good than all the fitness products on the market. It strengthens the arms, shoulders, chest, abs, and even the legs. Plus, it costs you nothing. You need only a small amount of space and the motivation to improve yourself. And don’t beat yourself up if you can’t do a standard push-up right away. There’s no shame in starting at the intermediate level by bending your knees. Soon you’ll be pumping them out with the best of ’em. Situps or leg raises. This exercise will bulk you up without draining your wallet. Some people have trouble doing sit-ups because of neck or back issues. If that sounds like you, then leg raises are a great alternative, according to the fitness experts at the New York Times. Squats/deep knee bends. Not only will this exercise give your legs a great workout, it’s a perfect way to get cardio benefits at the same time. The burpee is a more advanced variation of the squat, one that combines the benefits of squats and pushups while getting your heart going. Walking. Yep, you read that right. According to Mayo Clinic, you can enjoy fantastic health benefits simply by putting one foot in front of the other. Start by walking 30 minutes 3-4 times a week, then increase the intensity by picking up your pace or walking hills as time goes on. Make sure you wear comfortable shoes and dress with the weather in mind. Have a workout partner. The two of you can keep each other pumped as you sweat the pounds away. Your children can also accompany you in a stroller, on foot, or even a scooter or bike. Give yourself positive feedback each time you complete a routine. For example, you may allow yourself a new workout shirt in return for week of cardio workouts. Visualize the results. Picturing yourself as the person you want to be can inspire you to get off the couch and get moving. Try it. After a few months of commitment to the above, you may consider expanding the workouts you try. You can add simple (and relatively cheap) items to your home gym to start incorporating more advanced exercises into your routine. By doing so, you’ll continue to see results month after month. Get on the road to a new and better you starting today – you’ll look back on the decision as one of the best things you’ve ever done for yourself. Divorce is a traumatic and stressful experience which can trigger many negative emotions. A person may feel unsettled, frightened and uncomfortable with the many changes they are going through. They may experience depression, guilt, anger and despair over the ending of their relationship. They may also feel frustration, fear, and anxiety about their future. The ending of a marriage frequently leads to sadness. A person may also dread the prospect of being single. If they’ve been married for a long time, they may also have to deal with changes in their social and financial state. Divorce can bring out the worst in people, leading some to make to petty demands and display abusive behavior. Some people may begin to feel guilty that they were not able to do more to save their relationships. Others may become depressed at the thought that their life is going to change and they may not be able to handle it by themselves. All of these jumbled up emotions can make a person miserable. As painful as these emotions are, they are a natural part of the grief process. This is how many people respond to life-altering events. These emotions are difficult to handle and there is no cure for how you feel. However, there are some healthy ways to handle your feelings, so that you can gain strength, compassion, and wisdom from what can be a very negative experience. Your emotional healing process begins when you allow yourself to grieve the end of your relationship and you will begin to heal when you can finally move on with your new life. Some people find that sharing their feelings with others can reduce their suffering. A sympathetic ear can do wonders for a person in emotional pain. That’s the reason people turn to family and friends when they are in the process of getting a divorce. They ask for assistance and support from the people they trust and those who are best able to offer help. While many people find someone who will allow them to vent their anger, cry out their hurt, talk about their fears and listen to them, it can be difficult for some to find that comfort. Many people have complex and stressful lives and over time, they may tire of listening to a person’s grief, especially if that person cannot get over their pain and move on. Unfortunately, some people find that they do not have anyone to support them through their divorce. For those people, support groups or a professional therapist can offer the help they need. The main benefit of attending a support group is that you are with other people who are going through the same type of situation. These meetings are usually held in a church or community center. A person can meet face-to-face with others in various stages of grief, all healing from the pain divorce has caused in their lives. In these groups, people come together to learn how to handle their emotions and support. Some people find it difficult to attend a face-to-face meeting or there may not be one available in their local area. Online support groups offer 24-hour support. However, the support provided is not as personal, although it is more accessible. With online support groups, a person has the opportunity to meet people who are going through the same pain. But be warned that these groups are often plagued by trolls who use this public forum to insult and ridicule others. If a person has existing mental health conditions, divorce can make things worse, especially for anyone suffering from anxiety, depression or personality disorders. Divorce is often viewed as a personal failure and for some, this increases any feelings of inadequacy they may already have. Therapy is one way to work through these feelings. Some people need to understand why their marriage ended and therapy can help give them a new prospective, which can help stop them from blaming themselves for everything that went wrong. Many people who have divorced have learned about what they want and don’t want from a relationship. However, in order to learn this, they need to discover more about themselves and their personal characteristics. Therapy, during and after divorce is more about a person learning about themselves than it is about them getting over their marriage. A qualified therapist understands the effect divorce can have on a person’s life and the changes they will experience during the divorce process. They can offer a person a place to vent in a healthy way. A person can talk openly about their fears and share emotions that may be too intense to share with their family and friends. A therapist can show a person various techniques to help with stress, grief and negative thinking. This can help a person going through a divorce to be a caring and effective parent who can help their child cope with the divorce in a healthy manner. It also lays the foundation for a healthy new life after the divorce is finalized. Before choosing a therapist, a person should interview several and then, choose a person that makes them feel safe, but is also prepared to guide them out of their grief. A person does not recover from divorce overnight. This is a process without any time limit. There are many changes to adjust to. It’s not uncommon when couples split that friendships are also dissolved and in-laws will be lost. This only makes the pain worse. A parent may also feel guilt over the pain divorce causes for their children. Getting the right support can help a person work through these issues in a positive way and can help to turn a difficult event into an empowering and life strengthening experience. Ferdinand Marin is the publisher of CBT Worksheets, http://cbtworksheets.com/ providing custom worksheets which help mental health professionals to more effectively and accurately use the Cognitive Behavioral Method in their practices. Visit CBTWorksheets.com to learn more. Happiness may have alluded one during marriage and finding it after divorce is high on the list. What exactly is happiness? It is a transient feeling which requires frequent boosters. Planning an exotic getaway, buying designer shoes on sale, or a day at the spa bring on happiness temporarily. Once the boost is over then one looks for another fix. We are born with a set point for happiness and various studies put it between 33% to 50%. This means that how happy we are is partly due to genetics and we can control the rest. Some people seem to be born cheerful and others more morose, as I have witnessed in the school setting. Andrew Carnegie, the American philanthropist born in Scotland, said “If you want to be happy – set a goal that commands your thoughts, liberates your energy and inspires your hopes.” During divorce, just surviving and getting through it may be the goal. After divorce come up with long-term ones such as exploring the world, a better financial situation or balancing family and work. Cultivating a positive outlook helps one to view the world as a friendlier, safer place. If one expects to be treated badly, then they perceive normal interactions with others as negative. In one study on happiness, people were asked to think about a memory. The happier folks thought of happy ones. The test subjects who were depressed gravitated towards sad or unhappy remanences. What is the secret to happiness? Harvard psychologist Dan Gilbert states “The quality of connections with people is the biggest predictor of happiness.” This message is echoed in a 72 year study by Harvard of 268 men in regards to life satisfaction and happiness. Psychiatrist George Valliant was one of the researchers who found that “The only thing that really matters in life are your relationships to other people.” Post-divorce focus on the quality of the connection with other people. Having several close friends brings more happiness than 500 ones on social media. What is important is engaging with others. Strengthen your ties to friends post-divorce. American psychologist Jaime Kurtz has done much research on happiness in the field of positive psychology. To sustain happiness is to have meaning and purpose in life. Ask yourself these questions. What inspires you? What is your passion? What drives you? If you are drifting along and not sure what you want to do after divorce, map out a life plan. Where do you see yourself next year, in five years, in ten? Giving back to others, whether volunteering, doing pro bono work, or mentoring helps give meaning to life. It is easy to be self-absorbed and reaching out to others creates healthy connections. Some people post-divorce started practicing gratitude, where they learned on a regular basis to appreciate the good happenings in their lives. Stop and notice the little things. Divorce can be a time when lives are in an upheaval and the stress level climbs to stratospheric heights. One’s mind and body need a break from the chaotic atmosphere of divorce. What some people do is escape to a special place for a breather to regroup. Is there a destination that brings you joy and contentment? For me it is Kirkwall in the Orkneys or being on a relaxing sea voyage. A divorced friend goes to Aspen, USA to hike and breathe in the fresh mountain air. This revives her to face whatever is ahead. Think about a short getaway from daily burdens during an acrimonious divorce or when post-divorce issues are emerging. Go on a day trip if going farther afield is not feasible. Some have gone back to the comfort of their childhood homes and met up with old friends. The point is to recharge your batteries by going to your place of refuge. It can be as low-key as spending the afternoon in your favourite café people watching and reading. Coffee shops are friendly and one can get to know the staff. My friend and I have ours in Marylebone, London and they ask us if we want “the usual.” It is a way to feel connected and have a pleasant time while forgetting about one’s troubles. A local pub might be someone’s sanctuary (I have one of those too) where you laugh and chat with the regulars. It might be somewhere quite different, such as a bookshop. Hatchard’s on Piccadilly knows my taste and always recommends some great books. Getting engrossed in these mysteries also is a way to shut out the world. There are therapeutic trips to consider – yoga retreats near home or in distant places like India. Getting pampered in a country hotel spa or around the corner, such as Neal’s Yard, helps one to look and feel rejuvenated. There are divorce retreats and workshops in picturesque places around the UK. Sometimes it is easier to take off from work when going to a professional conference. Pick one that includes a tour or is set in an exotic locale. It is interesting to meet with foreign colleagues and learn some new job skills. I went to some great nurses’ conferences in places such as Kenya and Egypt. In the middle of my divorce I fled to one in South Africa while my mum stayed with my teens. This is probably what saved my sanity in the midst of contentious proceedings. Going to one’s sanctuary during divorce can be internal and not on a physical level. Several divorced people said that they mentally visualize their special place and go there whenever needed. It may be a beach, city or rural setting. Whether divorce was discussed by you both as a possibility or if taken by surprise, it still comes as a jolt. Calmly talking about an imminent split does not take into consideration all of the legalities and hoops to jump through to complete the process. 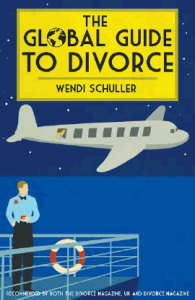 It can feel as if one is drowning in all the minutia that comes along with divorce. How to climb out of this pit? Discuss with your solicitor or mediator how you are feeling, such as discouraged and overwhelmed. They want you to be at the top of your game so may be able to streamline the process by bringing some experts on board. Our collaborative solicitors called in an interim child psychologist to set up and monitor visitation during the divorce itself. This took that burden off us parents. She met with our sons to ensure visitation was working out and if the boys were okay. They were not, so she arranged for them to have a therapist. Lighten your load with the expertise of other professionals to make the process go more smoothly. Another example is having a financial advisor work with the divorce team to oversee the division of assets. It is easy to get so immersed in proceedings that one lets other areas slip, such as sleep, nutrition and emotional well-being. Stress decreases the efficiency of the immune system which makes one more susceptible to colds and the flu. Realize that you will have good days and bad ones. Sometimes you feel that you are on top of things and other times that you are skittering on the edge of a breakdown. Divorce is not a straight line, but looks like a graph with peaks and troughs. Do not think of being stoic or going though divorce alone. This is the time to vent or seek feedback. Let people share their wisdom to help you have an easier time. One great piece of advice that I received, was to let go of the small stuff and focus on what really mattered to me. Fighting over every little thing makes the divorce more adversarial and prolongs the proceedings. Neither of you win and the divorce professionals net higher fees for this battle. Spend time with supportive people and ditch (at least temporarily) those who are not. Get energized by upbeat folks and have some laughs. Schedule some pleasurable pursuits into your agenda. Divorce is a temporary episode in your life – perhaps 1/85 of it. Put that in perspective. When we are stressed, the hypothalamus activates the sympathetic nervous system and the adrenal-cortical system (via bloodstream) to produce the fight or flight response. The problem is when we stay in this state, it wreaks havoc with the body’s functioning. Being chronically on red alert affects the immune system, decreasing white blood cells and making us more susceptible to colds and the flu. High cortisol (stress hormone) levels raise the heart rate, blood pressure and the probability of insomnia. Holy Basil is an ayurvedic medicine from India which has been around for over a millennium and lowers cortisol. It has helped my friends and I feel more balanced using it. Another great resource is Bach’s Flower Remedies which have been around since the 1930’s. They have homeopathic medicine for very specific anxieties. For example, Walnut is for those facing a change in their life, such as divorce or a new job. I use White Chestnut before I go to bed for a more tranquil rest. It is used for stopping persistent thoughts in one’s mind, which can be a problem post-divorce. Their Rescue Remedy is for an acute situation and I use it to stabilize one woman in a panic attack so she could get out of the building and be taken to urgent care. Bach’s Sleep Rescue Remedy is fabulous to use when one wakes up in the middle of the night or to get to sleep. I keep a bottle in my nightstand to squirt in my mouth. Consider adding supplements to your regime. Omega 3 helps to keep a steady heart rhythm and maintain flexibility with blood vessels. Stress depletes B Vitamins, which are crucial for the immune system, so it is beneficial to take these post-divorce. Up your intake of protein and green vegetables. If cooking is too overwhelming, get healthy take away food from a natural grocer’s café. Practicing gratitude during divorce may seem as much of a dichotomy as an elephant riding a bike. 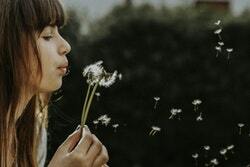 Various studies validate the link between keeping a gratitude journal which results in the outcome of increasing joy, enthusiasm and the feeling that life was getting better. These individuals were more apt to reach out to others and willing to offer support. These are all actions which will enable divorce to be an easier experience. In a study done at university of California, subjects either kept a gratitude journal or wrote about problems or neutral subjects weekly. At the end of the study, those in the gratitude group achieved their goals quicker and scored higher in feeling more positive about their lives. Psychologists Robert Emmons and Michael McCullough are in the forefront of doing research in the field of gratitude and find that those who practice it, have an increase in their amount of exercise and are more optimistic about what is happening that week. Medical research looks at an EKG as one tool in determining the effects of gratitude on the heart. These studies are indicating that practicing gratitude has a positive effect on the parasympathetic nervous system which regulates heart rate, rhythm, blood pressure, and other body functions. Thoughts influence body functions. Happy thoughts (like gratitude) increase endorphins (the feel good neurotransmitters) and angry ones cause constriction of blood vessels, leading to cardiac disease. Energy goes where your thoughts are, and if your focus is on misery, then that is what you’ll experience. Just as weight training enlarges muscles, gratitude is a way of training yourself to notice the good things that are happening around you. Various studies found that men have better health and larger social connections as a result of being married. This may be due to their wives arranging gatherings with friends or encouraging doctor visits. In marriage, women have the financial cushion of a dual income and a handyman around the house. I thought it would be nice to always have a date for New Year’s Eve when being married. The Center for Disease Control (CDC) said married men were more likely to have had a doctor visit during the last year. The National Health Interview Survey (NHIS) found that married men between ages 18 to 64 were more apt to get preventative health care than their single counterparts. The U.S. Preventative Services Task Force found marriage increased men getting “clinical preventative services” such as diabetic or cholesterol screenings. Why is this so? Women are usually the captains of household health, taking kids to the pediatrician and going to their regular OB/GYN appointments. After a divorce, women continue to go to these doctor appointments and have preventative tests, such as mammograms. Their health remains status quo. Men may put off making a routine doctor’s appointment for a check up when they feel line. Women are the ones who are influencing spouses to get preventative and acute care. The Canadian Journal of Urology reported that unmarried men with prostate cancer are more likely to die from it than are married men. Divorced/single men came in later for a diagnosis than their married peers, resulting in having a cancer that was in a more advanced stage. Although this is changing, right now women do the majority of the cooking in the home. They are the ones selecting tasty and nutritious food. My friend’s husband calls her most days from work to see what is for dinner. Women are used to cooking healthy meals and continue to do so after divorce. Eating out with pals is a fun pastime that we do, whether married or divorced. Marriage is not particularly increasing women’s nutritional states as it is for males. 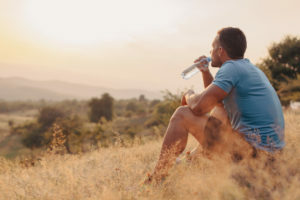 Dr. Kawachi of the Harvard School of Public Health did a study with 30,000 men and found that recently divorced men had a decrease in a healthy lifestyle. He found that they drastically reduced their vegetable intake and upped their consumption of fried food. I could not find any results like this for women. The New England Research Institute did a study that found 62% of men rely on their wives as their main social support. Women have wider social contacts and have friends to confide in besides a spouse.